The Hida area is surrounded by mountains. People here have long used trees for architecture, furniture, wood carvings, floats for local festivals, Buddha sculptures, etc. Techniques for the treatment of wood in the Hida area are so highly developed that in Japan carpenters are referred to as ‘Hida-no-takumi’, ‘takumi’ meaning specialists in woodworking. There is a curious place whose name is ‘Hida-kaiun-no-mori’. There is a story about ‘Hida-no-takumi’. This place name means ‘good luck forest in Hida’. 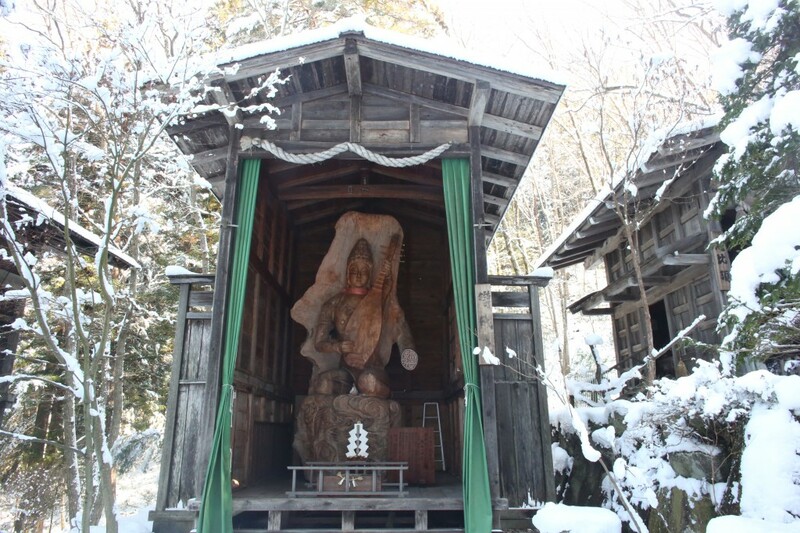 In that place there are ‘Shichi-fukujin (the Seven Deities of Good Luck)’ and Sri-mahadevi. Sri-mahadevi is also the god of wealth. The seven gods of good fortune are from Japanese mythology and folklore. Each statue consists of one tree. The highest statue is over eight meters high. Those statues are noted in the Guinness Book of World Records for 2002. The statues were made by Mr. Satobee Yamamura (1908-1988) and Mr.Ensho Nakamura (1942-1988). They formed a good partnership even though the difference in their ages was 34 years. They were referred to as the ‘Jingoro partnership’. 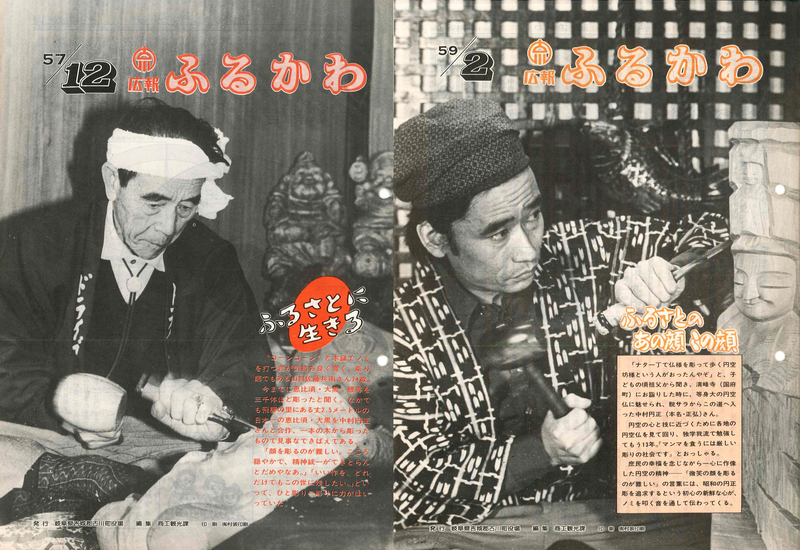 ‘Jingoro’ was a high ranking person who was a specialist in carpentry in the early years of the Edo Period. Satobee-san was born in the town of Furukawa in 1908. He was not drafted during the Second World War, because he was physically weak when he was young. During the Second World War, he was apprenticed to a sculptor. He carved only a part of the face of the statue at that time. After the Second World War, he became a well-trusted member of a town assembly for 20 years. While he was in the town assembly, he made the statues of the ‘Shichi-fukujin’ from local trees. Sometimes he would pick up waste wood and use it for a statue. These statues were made by Satobee-san. The center statue is of Daikoku-san and made use of waste wood. Also, wood that was not used for a statue he would shave into thin plates. He would write a proverb on them and give them to the people around him. Ensho-san was born in the town of Furukawa in 1942. He began learning to sculpt statues when he was 29 years old. He earned the nickname ‘the Enku of Hida’. 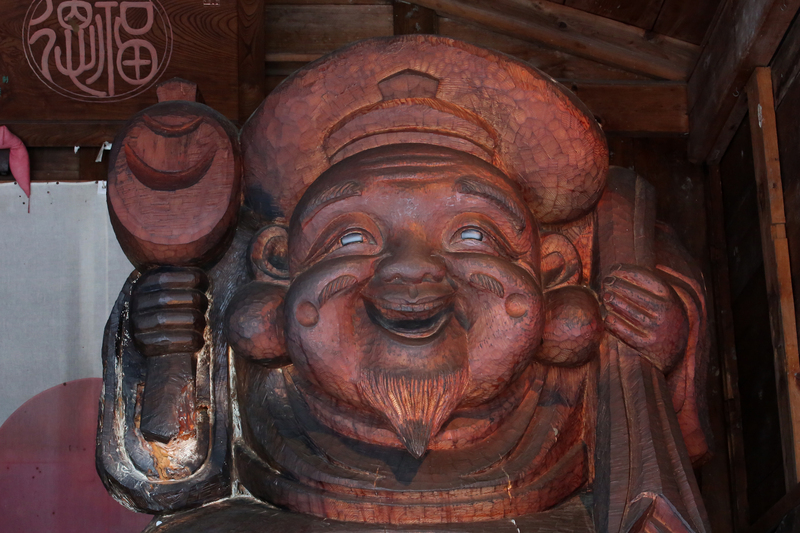 Enkuu was born in Gifu prefecture and was famous as a person who made many Buddhist statues in the 17th century. Ensho-san was really fond of Enku’s statues. He’s reported to have said, ‘I’m not an artist, and I’m not a craftsman. I’m just making Enku’s statues’. His spirit was similar to Enku’s. 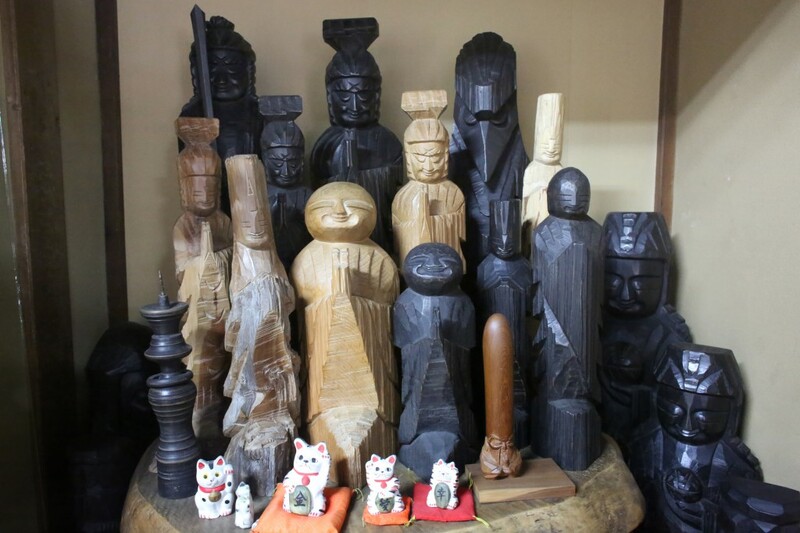 These statues were made by Ensho-san in Enku style. Mr. Nobuo Kuratsubo is the owner of ‘Hida-kaiun-no-mori’. In 1980 he dreamt that the Seven Deities of Good Luck came down from the mountain. A few days later, he found an old fallen cedar tree that was eight meters high and 700 years old at the lumber mill. That tree had been hit by a thunderbolt and broken. Also it had a big knot in its trunk, so it was useless for architecture or furniture. Mr. Kuratsubo was interested in the tree, and he bought it a few days later. He kept looking at it at his home, and then Daikoku-sama, the god of wealth with his big fortune bag, appeared from the tree. A few days later he, along with Satobee-san and Ensho-san, gathered and talked about the tree. They decided to carve Daikoku-sama and Ebisu-sama from this one tree. Satobee-san carved only the face, and Ensho-san carved the rest of the body. It took one year to complete the sculptures. After that, Mr. Kuratsubo couldn’t decide where the two statues should be set up. He had another dream and in it Daikoku-sama walked about 100 meters eastward from his house. So this is how he decided on the place where they would be set up. After that, Mr. Kuratsubo would sometimes find revelation in a dream, and he would find trees for the statues. 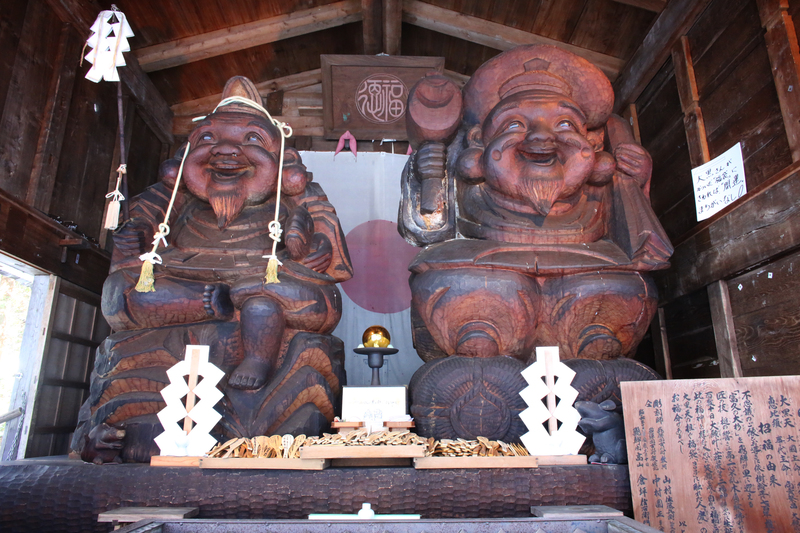 Satobee-san and Ensho-san completed eight statues in the course of ten years. The highest statue is over eight meters high. Sarasvati / Benzai-ten (goddess of knowledge, art and beauty, especially music) with itakura. In Hida, wooden storehouses are commonly used instead of earthen storehouses (dozo). Shunko Ishida, a “Hida-no-takumi” architect, built these impressive itakura. Originally, there was no water source within this 1700-square-meter natural forest. One day, Mr.Kuratsubo had the dieties revelation about where to find a water vein. 1700 days after the Daikoku-sama statue’s completion, people were able to get water from a spring. To this day people offer the sacred water, “fukutoku-no-mizu (water of luck and virtue)” to the Seven Dieties. 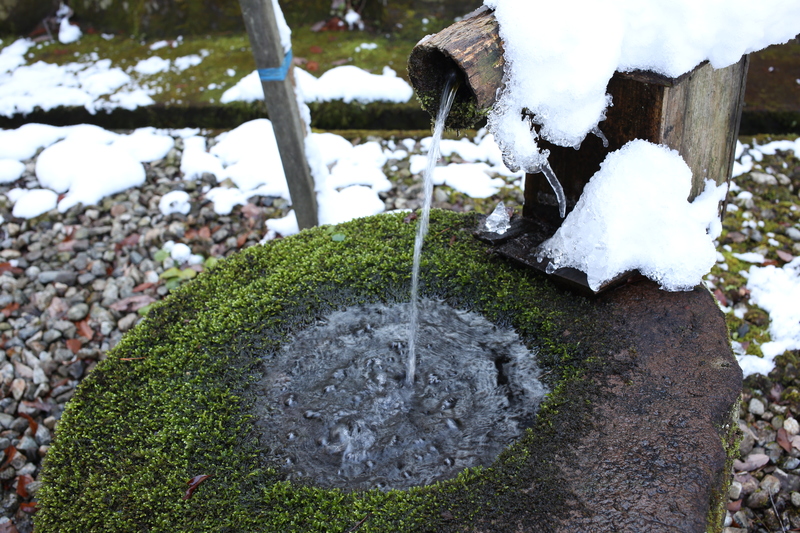 They also brew sacred sake (omiki) named “Fuku”, using this sacred water. 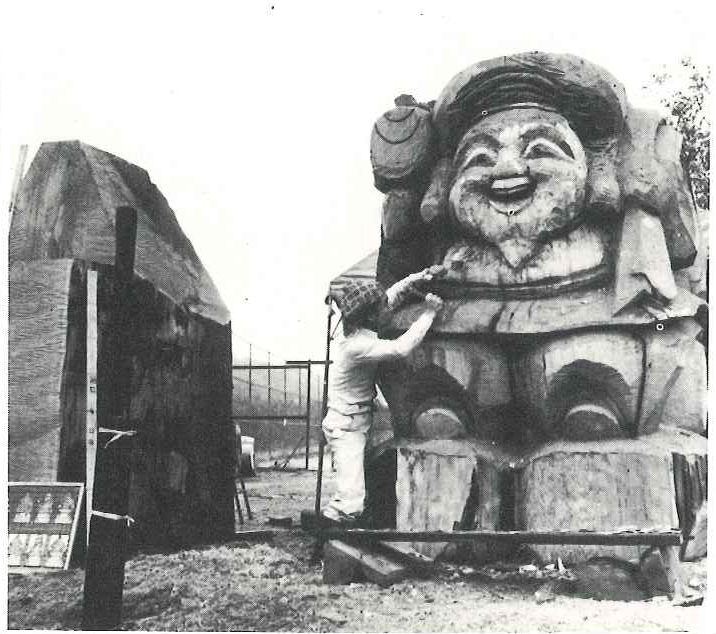 Only Jurojin statue, their latest work, is enshrined at Sugo Drive-in, along with another set of the Seven Dieties, about two feet in diameter, that Satobee-san worked on alone. 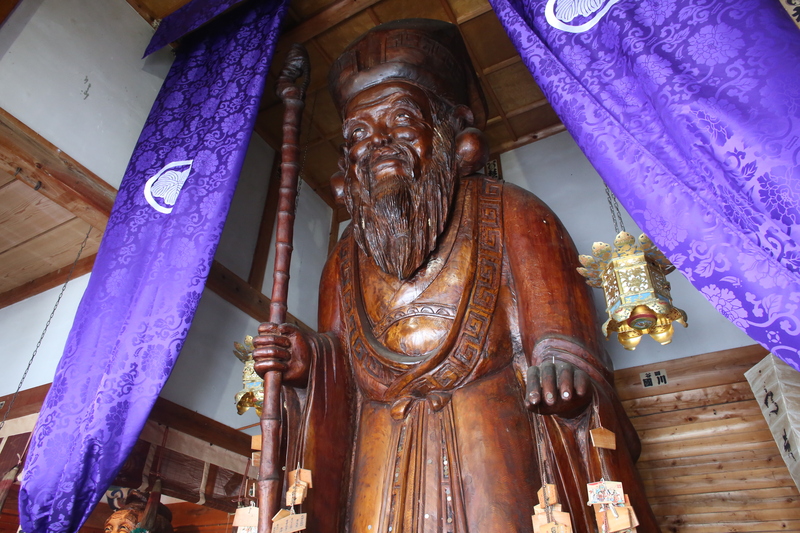 Jurojin (god of long life) is more than 8 meters high. 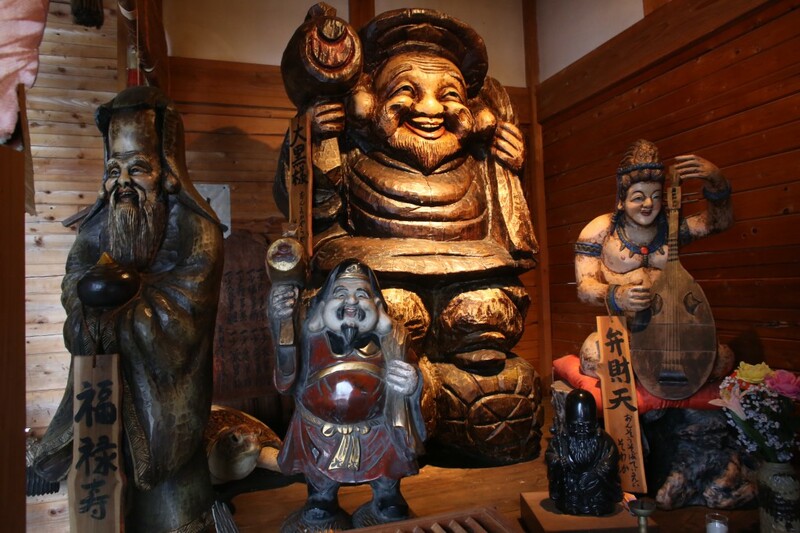 After Satobee-san and Ensho-san finished the eight statues together, Ensho-san carved a statue of Fudo Myoo (Acala, one of the Five Wisdom Kings) by himself. The Fudo Myoo statue was finished in July 1988; four months later, in November 1988, Ensho-san passed away at the young age of fourty-four. Satobee-san passed away a year later, at eighty, as if he was following Ensho-san. Those processes took place beyond human power. “Kami, the divine, is the origin of creation (soh-zoh, 創造) ; a human being is at the point of contact with imagination (soh-zoh, 想像),” Mr. Kuratsubo tells us. The divinity of nature is expressed in art. It welcomes us, and it reaches us. The spirit of the trees of Hida Mountains, even when they are not in the form of Buddha statues, watches over the land and its people.